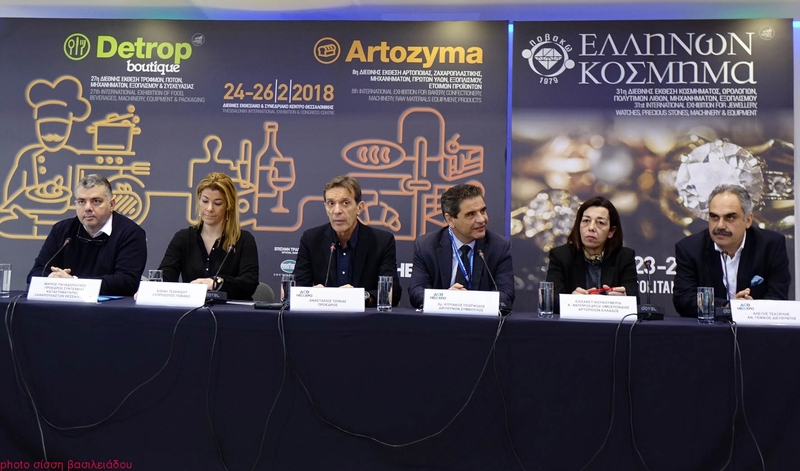 Three important exhibitions, Detrop Boutique, Artozyma and ‘Hellenic Jewellery Fair’ will drop the curtain on February at TIF-Helexpo, which - over the next four days - will be in Thessaloniki and Athens simultaneously, providing a forum for 654 businesses in the three sectors. From left to right the President of the e Guild of Confectioner Shopkeepers of Thessaloniki, Mr Marios Papadopoulos, the representative of POVAKO, Mrs Eleni Tezapsidou, the President of TIF-Helexpo, Mr Tassos Tzikas, the CEO of TIF-Helexpo, Mr Kyriakos Pozrikidis, the First Vice-President of the Hellenic Federation of Bakers, Mrs Elisavet Koukoumeria, and the deputy General Director of TIF-Helexpo, Mr Alexis Tsaxirlis. Specifically, Detrop Boutique has drawn 230 exhibitors (food businesses and industries from all over Greece), which is a 30% increase in relation to the previous event and is being held in four pavilions (8,9,10 and 12). There will be nine Regions of Greece participating in the exhibition, Central Macedonia, Eastern Macedonia-Thrace, Thessaly, the North Aegean, the Ionian Islands, the Peloponnese, the South Aegean, Central Greece and Crete. Detrop Boutique’s side events titled ‘Pairing Experience’ consist of four separate events, of which the first - and largest - is ‘Food Bars’ in pavilion 9. The second event is the Cheese & Wine unit at pavilion 8, which this year also features accompanying products (condiments, etc.). The third event is the ‘Exhibitors’ Corner’, an “index” at the entrance of pavilion 10 featuring all participating products and producers in a physical catalogue. The fourth event will include speeches and presentations by chefs and specialists on gastronomy and food current news. On its side, the 8th Artozyma has attracted 86 direct exhibitors (an increase of 37% in relation to the previous event) and 86 indirect exhibitors, international participations (from Romania and Bulgaria), while the exhibition space has been increased by 55%. This year’s Artozyma is hosting a major thematic exhibition for gluten-, lactose-, sugar-free and vegan products, namely all the ‘Free From...’ range. The Greek gluten-free product unit is the result of cooperation between TIF-Helexpo and the Hellenic Coeliac Association. -The 3rd Pan-Hellenic Bread Championship, which will last three days and will produce - for the second year - the National Baking Team, whose mission will be to promote traditional Greek bakery products beyond the borders of Greece. The 3rd Pan-Hellenic Bread Championship is being organised by GruppoFL in cooperation with the Bakers’ Union of Thessaloniki, under the auspices of the Hellenic Federation of Bakers and with the aid of TIF-Helexpo. The gluten-free event of the National Baking Team should also be noted. -The 24th Pan-Hellenic Confectionery Conference, the top confectioner’s event in Greece, which is being hosted by Artozyma for the first time. 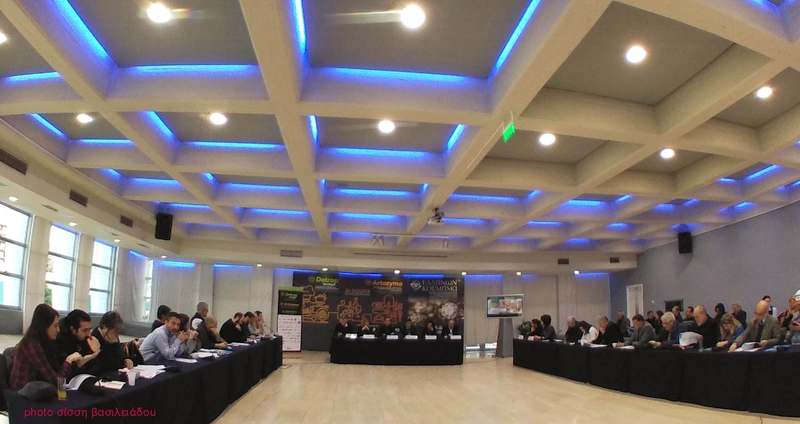 The conference is being organised by the Guild of Confectioner Shopkeepers of Thessaloniki, under the auspices of the Federation of Confectioner Craftspersons of Greece, and with the support of TIF-Helexpo, while it will also host the general meeting of the Federation. -The day-meeting of the Hellenic Association of Food Technologists on: ‘Baking - Confectionery - Ice Cream, Modern Trends and Prospects’. -Seminars on many current matters, such as leaven as a functional factor in baking and its role in forming organoleptic properties, alternative sweeteners in flour baking and confectionery, sugar-free desserts and ice creams, etc. Apart from the two exhibitions in Thessaloniki, ‘Hellenic Jewellery Fair’, the largest jewellery and timepiece fair in Greece, will be held at Metropolitan Expo exhibition centre in Athens from 23 to 26 February, in cooperation with the Pan-Hellenic Federation of Silver- and Goldsmiths, Jewellers and Watchmakers (POVAKO). With the participation of the most dynamic brands on the market, the Fair will cover 12,000 sq.m. and will host over 252 Greek and international exhibitors. International exhibitors will be visiting from Sweden, Cyprus, Italy, Germany, the USA and Turkey, while this year’s event will bring together all the latest trends and designs for jewellery and timepieces, the latest developments in the jewellery-making sector, as well as new ideas for displaying jewellery. The constant enrichment of the events of the national exhibition body was underlined by the President of TIF-Helexpo, Mr Tassos Tzikas, during his press conference today in view of the opening of the three exhibitions. He also stressed that the company is becoming increasingly attractive, which has resulted in it being approached by anyone who wants it to organise or promote their exhibition. On his side, TIF-Helexpo CEO, Mr Kyriakos Pozrikidis, pointed out the gravity of the three events, the plethora of side events, as well as the company’s close cooperation with the organising agencies towards their success. The significant increase in the number of exhibitors at ‘Hellenic Jewellery Fair’ over the last five years - following the cooperation of TIF-Helexpo and POVAKO - was noted by the representative of the Federation, Mrs Eleni Tezapsidou, who also underlined that it is imperative for Greek jewellery to find its way abroad. The constant increase in the numbers of visitors and exhibitors of Artozyma was highlighted by First Vice-President of the Hellenic Federation of Bakers, Mrs Elisavet Koukoumeria, who stressed that it was the only option, since the event concerns fresh bread, the trademark of bakers. “Bread is culture. That is what we have come to show”, she noted. His belief that desserts are the best ambassador of Thessaloniki was expressed by the President of the Guild of Confectioner Shopkeepers of Thessaloniki, Mr Marios Papadopoulos. He also mentioned the event of the Pan-Hellenic Confectionery Conference, which is being held in the framework of Artozyma for the first time, with the participation of 270 confectioners from all over Greece. The high number of events this February was highlighted in turn by the deputy general director of TIF-Helexpo, Mr Alexis Tsaxirlis, who characterised this month as the strongest regarding exhibitions, with six events which are expected to draw more than 200,000 visitors. He also noted that the dynamism of the exhibitions is due, to a great extent, to the cooperation with the agencies.